State officials are banning trucks, buses, and other heavy vehicles starting this morning from left lanes of the Longfellow Bridge between Boston and Cambridge as a safety precaution. 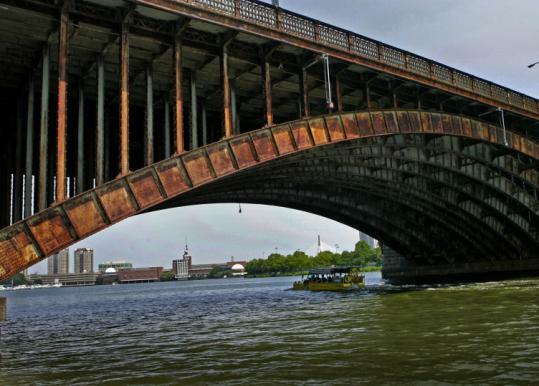 The Department of Conservation and Recreation, which has had inspectors checking the 100-year-old bridge over the Charles River almost daily in recent months to make sure it is safe, got a report yesterday from consulting engineers advising that because of rust and decay they have identified in supports under the roadway lanes closest to the MBTA Red Line tracks, heavy traffic should get off those lanes. The right, or outer, lanes remain safe for all traffic of all legal weights, and the situation poses no threat to Red Line trains, officials said. The bridge - sometimes called the "salt and pepper bridge" because of its four towers that look like spice shakers - needs a complete overhaul estimated to cost over $200 million, but officials don't expect to be able to begin that work before 2010. The department has spent more than $1.2 million since August on emergency repairs. "Always erring on the side of caution and public safety, we now think it is prudent to limit the truck traffic in that left lane until all these repairs are finished," the department's commissioner, Richard K. Sullivan Jr., said late yesterday. Sullivan said the engineers' report identified no danger of the bridge suddenly collapsing. If the situation were to get more serious and support beams began failing, engineers would see the left traffic lanes of the bridge gradually sinking, Sullivan said. "There wouldn't be a catastrophic event," Sullivan said. The agency will install a flashing message sign telling motorists that larger vehicles are banned from the left lanes, and State Police will enforce the weight ban in those lanes, Sullivan said.